Cube steaks are a great inexpensive cut of beef that tastes great when prepared properly. 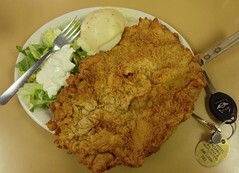 Today’s secret recipe will show you how to make Denny’s home-style chicken fried steak. These steaks come out perfectly tender with a crisp coating. Serve with some mashed potatoes and a steamed vegetable for a complete meal. The night before, put the steaks in a dish in single layers. Wipe them on both sides with an even coating of corn oil. Dust them on both sides with a generous amount of season salt. Drizzle each steak with wine or juice. Seal the dish in doubled foil or plastic wrap and refrigerate it for about 24 hours prior to preparing the final dish. Remove the steaks from the fridge and coat both sides well in the biscuit mix. Combine the butter with the oil in a large skillet until melted. Brown both sides of each steak, until crispy. Transfer right back to the same baking dish and seal in foil. Bake at 375 degrees F about 30 minutes. A simple soup for any cheese lover! Put butter, soups, mayo and Cheez Whiz in 1-1/2 quart saucepan, stirring constantly over medium heat, until smooth. Stir in broth and season to taste with salt and pepper. Stir occasionally until piping hot but be careful not to let it boil. The night before, put the steaks in a single layer on a dish. Brush them on both sides with an even coating of corn oil. Dust them on both sides with a generous amount of seasoning salt. Drizzle each steak with wine or juice. Seal the dish in foil or plastic wrap and refrigerate it for about 24 hours prior to preparing the final dish. Remove the steaks from the fridge and coat both sides well in the bisquit mix. Season with salt and pepper, to taste. Place the steaks in the skillet. Brown both sides of each steak, until crispy. Transfer to a baking dish and seal in foil. Bake at 375 F for about 30 minutes.